How often should I brush my teeth, and for how long? 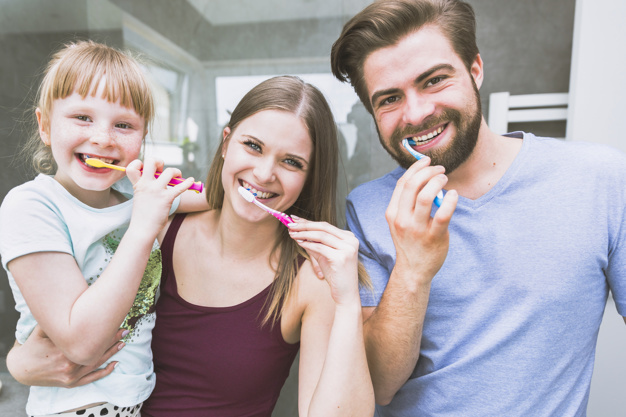 In order to effectively remove cavity-causing bacteria, you should brush your teeth for two minutes twice a day, with either a manual or an electric toothbrush. Many electric toothbrushes have built-in timers, but if you are using a manual toothbrush, consider keeping a timer in the bathroom to make sure you’re brushing long enough. What brushing technique should I use? Hold your toothbrush at a 45-degree angle to your teeth and brush in a circular or elliptical motion, pressing just firmly enough to reach between your teeth. Brushing too hard or using a sawing motion could cause your gums to recede and damage your teeth. Start brushing at the gumline and work your way down onto the teeth, brushing a couple of teeth at a time until you cover your entire mouth. Make sure to brush the outside and inside of your teeth, the chewing surfaces and between teeth, as well as your tongue. Your toothbrush should have a long, wide handle that allows for a firm grip, and the toothbrush head should be small enough to reach all areas of your mouth. Always make sure to use a soft-bristled brush because hard bristles can damage your teeth and gums. Old toothbrushes with worn and frayed bristles are ineffective and may harbor harmful bacteria. Make sure to change your toothbrush — or brush head, if you use an electric toothbrush — every three to four months or after an illness. When it comes to choosing the best toothpaste for you, it’s important to think about your unique oral health needs. Some toothpastes aim to alleviate pain associated with sensitive teeth. Some help to control plaque and tartar. Some are designed to remove stains and whiten teeth. Speak with your dentist to determine which is right for you. Always make sure to use toothpaste that contains fluoride, which fights plaque and cavities, and cleans and polishes the tooth enamel. As long as your toothpaste contains fluoride, the flavor, formula and brand do not matter. To clean your teeth effectively, use a pea-sized amount of toothpaste. If you use the correct technique, this should be enough toothpaste to cover all of your teeth. Is flossing as important as brushing? Yes. Flossing removes plaque and debris between your teeth, polishes the surfaces of the teeth, helps control bad breath and reduces your risk of gum disease. You also should floss for two or three minutes at least once a day, using an up-and-down motion and making sure to floss below the gumline. Mouthwash, also known as mouth rinse, is an over-thecounter product that you can use to help freshen breath and prevent tooth decay. Research shows that using a germ-killing mouthwash in addition to brushing your teeth can reduce plaque and gingivitis more than brushing alone.